It's hard to tell from the picture, but it pours a nice dark brown color, with some shades of amber, especially when you hold it up to the light. Solid sized head, but only minor lacing as I drink. Smells fantastic. It's got a really sweet and bready smell. Taste starts off well enough. A little sweetness up front and the finish is actually rather dry. Unfortunately, it tastes a little thin to me. This is fine at the start of the glass (I think it makes a good first impression), but it's not as satisfying as you near the end. There's definitely no complexity at all in the taste... but then, there don't appear to be any off flavors either. Also, I was brewing from a rather ordinary kit recipe that wasn't really attempting any complexity, so there's that. All in all, I think it's probably a step up from the typical macro light lager, but it's not going to light the world on fire either. I'll give it a C+, which I think is probably fair. Beer Nerd Details: 4.5% ABV bottled (12 oz). Drank from a tulip glass. This page contains a single entry by Mark published on February 13, 2011 10:55 AM. Brooklyn Local 1 was the previous entry in this blog. 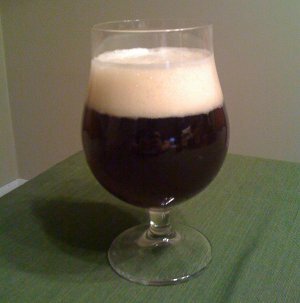 Adventures in Brewing - Beer #2: Electric Boogaloo is the next entry in this blog.